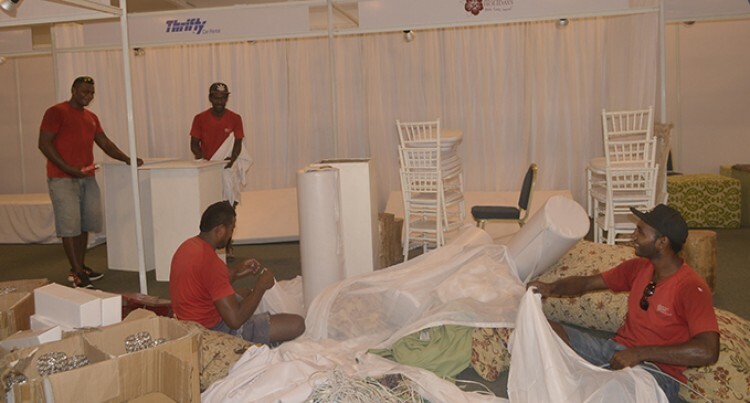 Various local tourism stakeholders are working around the clock in setting up appealing booths for the Fiji Tourism Expo (FTE) 2016. The three day event dubbed as Fiji’s premier tourism marketing event will begin this Tuesday. Tourism Fiji Global Public Media Relations manager, Patricia Mallam said everything should be ready by today. “On Monday, everything will be perfect, there won’t be any more work needed because the Tourism Fiji team have been working almost every night 2 – 3am in the morning to make sure it is ready,” she said. “Altogether there is combination of Tourism Fiji staff as well as partners on board to assist with additional labourers. Ms Mallam said they will be introducing a lot of new media platforms in the event. “Digital assets will be introduced as a lot more creativity on how we are setting up the social networking event,” she said. The media centre is a huge room set up, with a lot of working space, with an interview corner where interview can be done. “We have invested quite heavily into media because we value our media partners, not only international but local as well, so we got a much bigger media space,” she added. In addition to that social media will be playing a major role in promoting the event wholly Fiji as a tourism destination. “We have invested quiet heavily into running social media competition and just creating awareness and you know everyone here is able to have their network online and offline,” she said. This year, the expo is going to be much bigger and better than previous years. “We have got more buyers from last year especially now that long haul market from Singapore,” she said. She said the preparation has been absolutely on track and smooth running considering the recent setbacks suffered from Cyclone Winston, and Cyclone Zena including floods. “There was a lot of doubt from quite a few industry partners as well as some buyers whether this will eventuate. “We are very confident to say that we did not stop, nothing stopped us and we continued on the progress and we have even gone on from what we did for Fiji Tourism Expo last year. “Now we can access more buyers from UK, Europe, China and seeing the increasing numbers of buyers tells us that buyer confidence has not waived at all despite what happened, and they are more eager to come back to sell Fiji,” Ms Mallam said.